Running a snowmobile race team is an expensive endeavor, but one team is once again turning to a snowmobile forum community to help cover the costs. 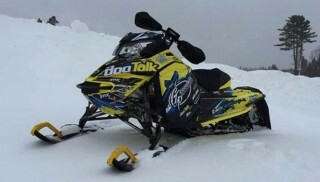 Goodwin Performance has returned for the 2014-15 snowmobile racing season and teamed up with DooTalk.com for its member-sponsored racing program. Members of DooTalk.com can buy laps for $5 each to help support the team. In addition to keeping the team running, supporting members also put themselves in position to take home some very nice prizes. 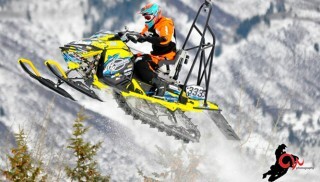 One lucky supporting member will win a 2015 Ski-Doo 600RS Cross Country snowmobile all done up in race sled graphics. * Buy 1 lap and get DooTalk.com sticker * Buy 5 laps and get a DooTalk.com toque and sticker * Buy 10 laps and get a DooTalk.com T-Shirt, toque and sticker * Buy 20 laps and get a DooTalk.com T-shirt, toque, sticker and one ballot for a chance to win the snowmobile * Buy 50 laps and a DooTalk.com hoodie, T-shirt, toque, sticker and three ballots for a chance to win the snowmobile. Lap sales are available until March 15, 2015. The giveaway snowmobile drawing will take place on or before March 19, 2015. Throughout the season, the team will be having 10 random drawings for other prizes for members who have purchased 10 laps or more. This year’s Goodwin Performance/DooTalk.com team consists of Garrett Goodwin (Adaptive Class), Brett Nastala (Pro Lite Class), and Eddie Neubauer (Sport Class). To help the team and buy laps, visit http://buylaps.dootalk.com/.